NEW YORK, MAY 26, 2016: SAMOCAT is kick scooter rental system comprised of compact docks with scooters available via smartphone. Lighter, easier, and more practical than a shared bicycle system, SAMOCAT kick scooters weigh only 11 pounds compared to a 45-pound CitiBike – scooters are sidewalk-friendly and very portable. Take it on the train, bring it to the office, rental scooters are the perfect solution for urbanites looking to travel quickly and easily, especially for that last mile of your journey. The team behind SAMOCAT is very diverse, mixing French, German and Russian engineers, designers, and entrepreneurs. In fact, “Samocat” means “kick scooter” in Russian. Now SAMOCAT has arrived to NYC as one of the premier companies selected into the UR- BAN-X Startup Accelerator program, powered by MINI Cooper and HAX, a division of venture capital firm SOSV with the goal of improving the quality of urban life. 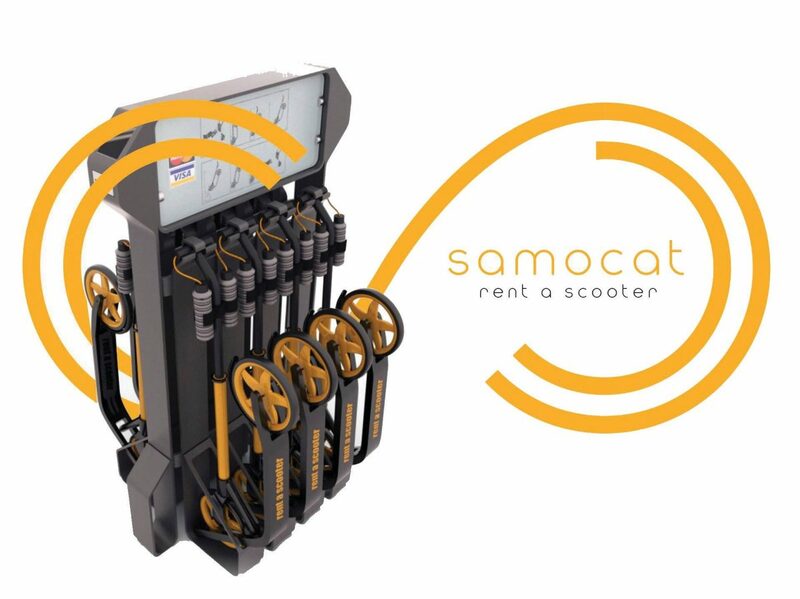 The SAMOCAT system is easy to use: at the station you can unlock the kick scooter with your smartphone or NFC card in less than 15 seconds and be on your way! The scooter has an IoT chip, so when you’ve reached your destination station you can easily return it to an available dock. Watch the video. Already in development with a pilot network in Germany for Detsche Bahn, SAMOCAT has received more than 60 demands for station networks ranging from small cities to local parks to hotel chains. And SAMOCAT is working with corporate campuses as well. A recent user test program in a German factory complex proved that employees using kick scooters travelled 70% faster than walking, saving the company up to $21,000 per month in lost travel time. Shared bicycle systems cost an average of up to $6,000 per bicycle for manufacturing and installation. The SAMOCAT system could cost as little as 10% of that rate, depending on the size of the system’s network, and this low cost can be passed along to the customers, of course. a theme park, or even an entire borough connected with quick and easy kick scooter stations! Your monotonous 10-minute walk just became a fun 3-minute kick scooter ride. This is SAMOCAT, your kick scooter rental system.